In Process - Sage Automation Inc. The pictured system is a custom built Sage robot that handles 2000 degree PM drill bits. 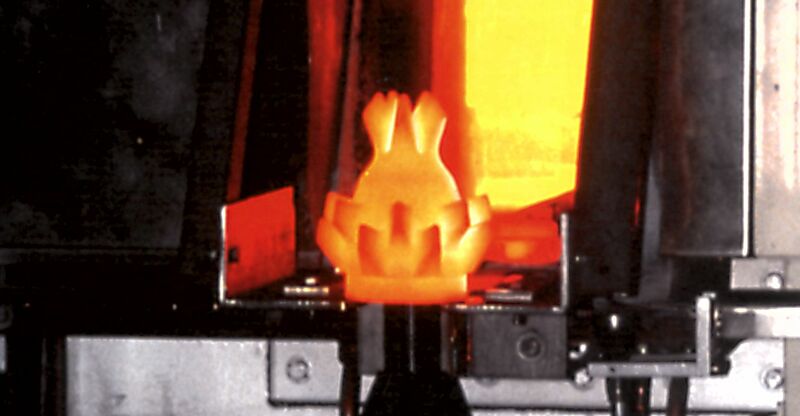 The robot puts the drill bit into a graphite bath for final high-pressure finishing. Sage Automation has built many robotic automation systems that can handle harsh and extreme conditions. Some of the robots and machines Sage has installed throughout the world have been installed outdoors exposed to all kinds of weather and variable operating conditions. Other robotic manufacturing equipment has been tasked to unload kilns in excessive of 2,500 degrees Fahrenheit. Sage carefully evaluates each case and draws on decades of experience to select the precise coatings, cables, motor specs, and fluids that are up to the task so these material handling application can operate in these harsh environments daily. No matter what part of the process you need automated Sage has a factory automation system for almost every stage of the Industrial and Robotic manufacturing process. Please contact Sage Automation for help with your project.